Colour - bright or dull green, brown, yellowish, or gray in color. Main Prey - crickets, wax worms, and butter worms. Found throughout most of Florida (except the Everglades and Keys), usually high in treetops. Has also been found burrowed in sand under logs or grass near breeding sites. Breeds in a variety of shallow wetland habitats (fish-free), including cypress domes, bogs, wet hammocks, and flooded ditches. DO NOT house barking tree frogs with other species due to the differences in care, temperatures, and the fact that some species can be highly stressed in the presence of other species. Frogs do shed their skin. It can be quite alarming, so it’s good to know what to expect. Your frog may crunch his body up into an uncomfortable crouching position. He will puff his body up to try to loosen the skin, then he will convulse as if he is coughing! As the skin is shed, he will eat it. It has many good nutrients, and your frog knows it! If the tank humidity is low, your frog may not shed properly. ENCLOSURE SIZE: A minimum of 4 gallons of tank space per frog, although a minimum of 20 gallons High is recommended. 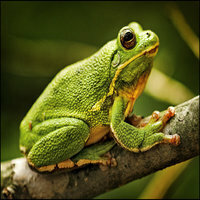 Remember that barking tree frogs are TREE frogs; they are arboreal; so a tank that supplies more height than width is always a better choice, such as a 20 High or 40 High. SUPPLEMENTS:Dust food with calcium supplement and vitamin supplements. As a rule, a growing juvenile's food (and a pregnant/gravid female’s) should be dusted more often than an adult's. Follow your veterinarian’s instructions for applying supplements to avoid over-supplementing food. Our veterinarian recommends dusting insects with a good quality calcium supplement fortified with vitamin D3, 2-3 times a week. (Avoid using a calcium supplement with added phosphorous, unless specifically directed by your veterinarian, since this can promote kidney disease.) Always consult your veterinarian for specific directions on supplementing your pet’s food, since there are many variables that go into determining the best supplementation regimen for each animal. March to August; lays eggs singly on the bottom of the pond. Breeding call is a hollow tonk, tonk; a chorus of frogs sounds like distant barking dogs. To hear frog calls, visit the USGS Frog Call Lookup and select the species you want to hear from the common name drop-down list.